I was diagnosed with Stage 4 bowel cancer when I was 24. Five years on and I am more physically active and mentally focused than ever before. My experience with bowel cancer wasn’t easy, but I have learned a lot in the process – about myself and about my body. Although I was always a fit person, my passion for health has only increased as a result of my bowel cancer diagnosis. Committed to growing and learning about how to best nourish and strengthen myself, I’ve spent the past year and a half studying in order to earn my Certificate 3 & 4 in fitness. Now I am a qualified Personal & Group Trainer.  What I’ve learned has really helped me to feel better and I’d love to share what I know with you so that you can succeed in your health goals. Before you undertake any sporting event, you'll need to take every precaution to prevent injury. To do that, you'll need to get your joints loose and your body mobile by doing some dynamic stretches and progressive movements. As the name indicates, warm ups should focus on warming up and loosening the body, preparing the nervous system by increasing circulation, while also preparing the mind for the challenge ahead. Dynamic stretching consists of controlled movements that will improve your muscular strength, increase your mobility and stability. Focus on plyometric drills to get the blood flowing and to increase your heart rate. It’s important to include these before your training to get the body moving in full ranges of motion and reduce the risk of injury. Avoid holding any stretches excessively and keep body movements flowing. 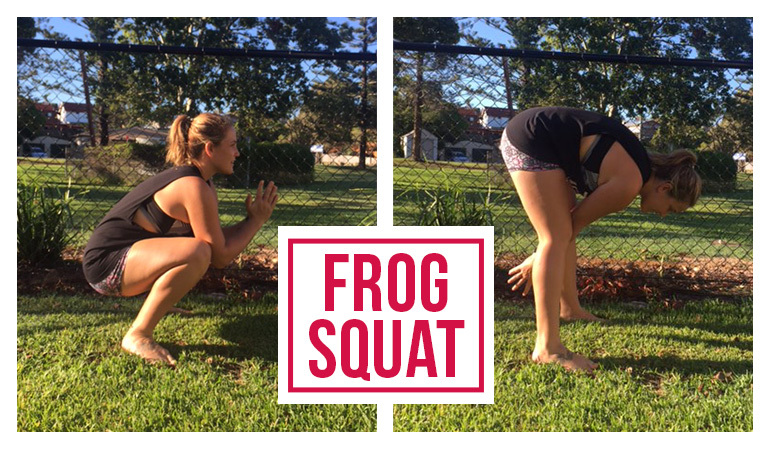 Below, are a few of my favorite exercises designed to get you ready for your first fun run! Let’s start by getting your body warm, mobile and ready to tackle the challenge ahead. This movement is great for increasing hip mobility and range of motion through the hamstrings when extending. Put your feet hip-width apart, your heels flat on the floor, create a nice neutral spine, extending out of the deep squat to stretch the hamstring and sink back down, keeping your chest and eyes up at the bottom. Repeat this movement for 10 reps, maintaining control without rushing. It will work on getting those hips mobile. 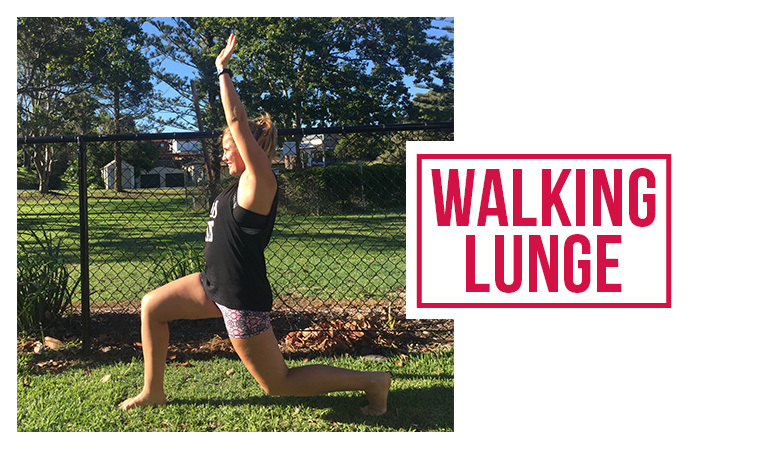 This movement is great for the hip flexors and hamstrings and gets the blood flowing to the muscles while loosening up the joints. Grab your training buddy and hold onto each other’s shoulder, or use a supporting bar or fence (see image). 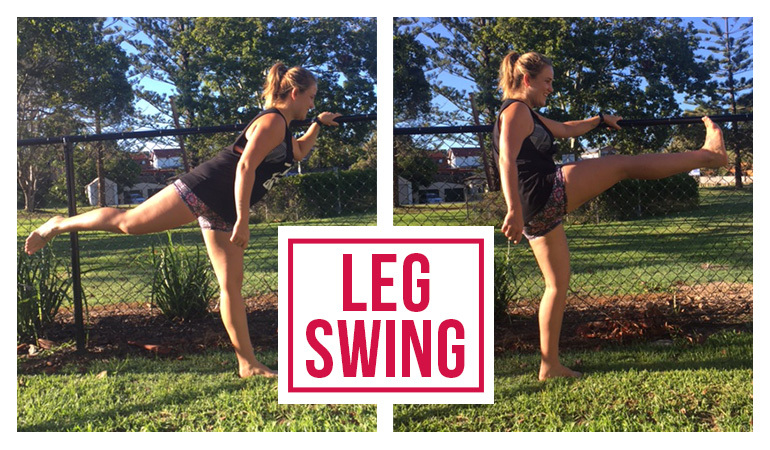 Swing one leg back and forth, starting slowly as you work into that range of motion, relaxing the hip and engaging your core. I would do 10 each leg forwards and back, then 10 each leg laterally across the body. Standing with feet hip-distance apart, start by wrapping your arms around your body as if you’re giving yourself a big hug. 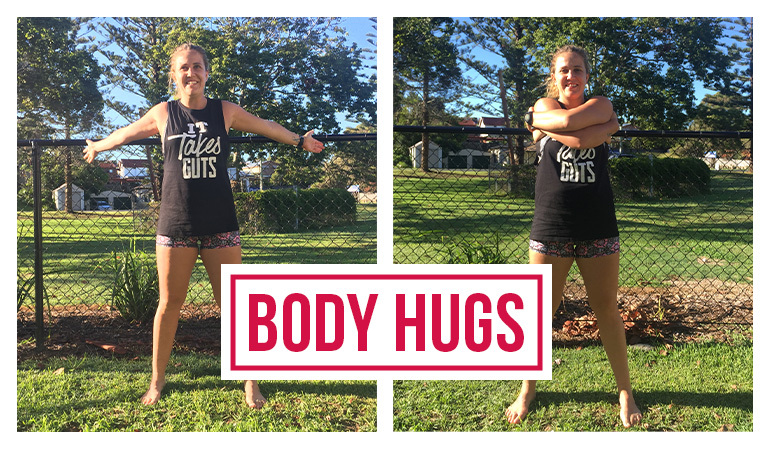 Gently release, opening up your hug as if you were going to hug someone else and repeat this movement working on opening up the stretch a little more each time, repeat 15-20 repetitions. This stretch is a great way to get the blood flowing to the quads, hamstrings, calves and glute muscles which are all going to be put to good use in this event. Taking a step forward, keeping your chest upright and lowering your back knee towards the ground reaching for the sky with the same arm, squeezing your glute to drive you forward and repeating this movement for 10 reps on each leg. Working through a combination of high knees and heel kicks will start to increase the heart rate. Keeping your shoulders back and hips forward, drive off your back foot and then drive your opposite knee as high as you can. 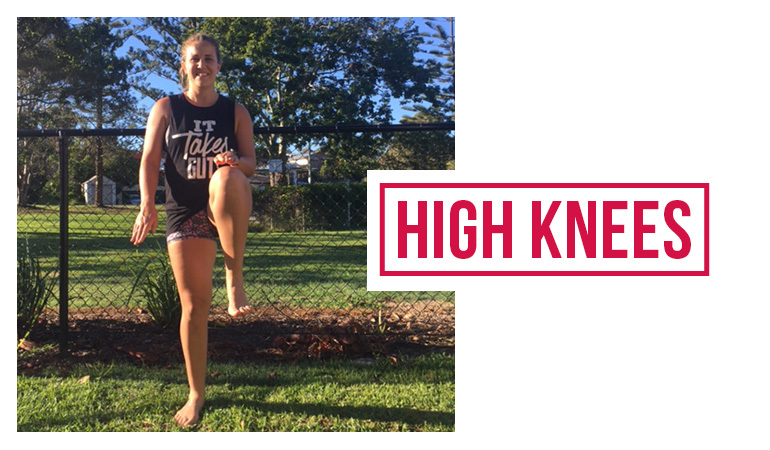 Start with 10 high knees then switch to working on kicking your heels towards the back of your body. 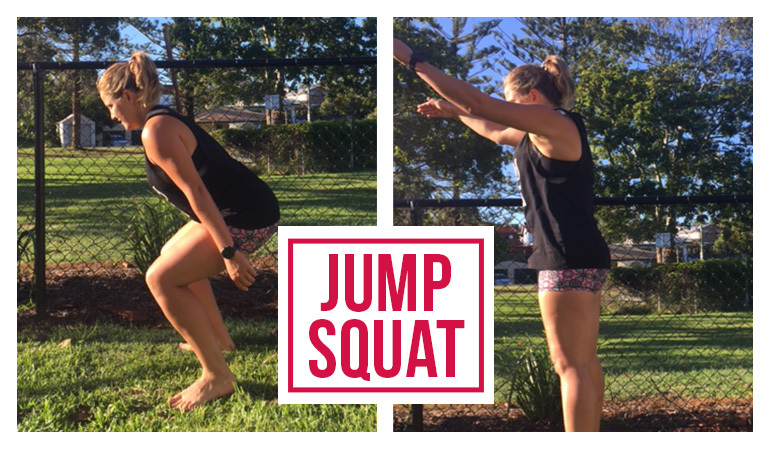 The jump squat is a great stretch to finish on, as it’s a powerful way to get your leg drive and heart rate up. Start with your feet hip-width apart, keeping your chest upright, lower your hips towards the ground, then explode up, using your arms to guide you.as you land keep your knees soft and continue the repetitions for 10-15 for 2-3 sets. As you land, keep your knees soft and continue the repetitions for 10-15 for 2-3 sets. Now that your body has warmed up, it's time to check in on your mind. Let’s do a quick mental check to ensure you're feeling confident about tackling whatever fitness challenge you've set out for yourself. In any sporting event, there will be many different levels of fitness. As a result, it's easy to find yourself looking around and feeling inspired or possibly intimidated. Remind yourself that you’re here to do your best. Be proud of every step you take and set some goals to reach throughout the event. Keep your mind strong and your body will follow. Remember what Henry Ford said; "Whether you think you can or think you can’t, you’re right."